Brooklyn is gaining a second axe-throwing bar, this time in Greenpoint. Bury the Hatchet, a growing nation-wide chain, is opening its first New York City location tonight at 25 Noble St.
Axe-throwing experts and novices alike will be able to hurl their hatchets at one of the bar’s eight lanes, and have a few drinks in between throws. The bar did not immediately respond to a request for comment, but Howard Klotzin, the owner, told the Brooklyn Paper that the borough is an entertainment hot spot. “People are starved for entertainment, and they’re looking for something different — and this is certainly different!” he said to the paper. 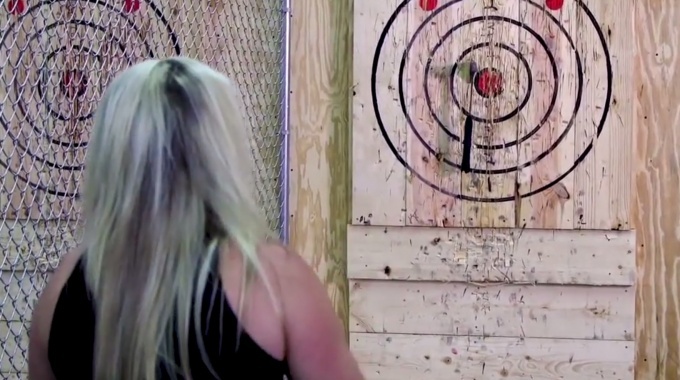 The sport of axe throwing, which hails from Canada, has grown in popularity across the US in recent years. Brooklyn’s first axe-throwing bar, Kick Axe, opened in Gowanus in December 2017. This is the Bury the Hatchet’s ninth location, but will be the first to have a full service bar and kitchen. The bar is still awaiting its liquor license, which Klotzkin hopes will come in the next few weeks. Until then, it will serve a menu of bar snacks and non alcoholic drinks. A two-hour session will cost $39.99 per person, with up to 12 players allowed per lane. Each session is overseen by an axe master who will keep score and make sure everyone stays safe and has a good time. Throwers must be 14 or older. For those interested in making axe-throwing a frequent outing, Bury the Hatchet will offer a competitive axe-throwing league. this is good news to the people nearby now they have something new to spend their time.